Everyone around Long Flat knows Kath Carey, and that’s why she’s gone on working for so long. 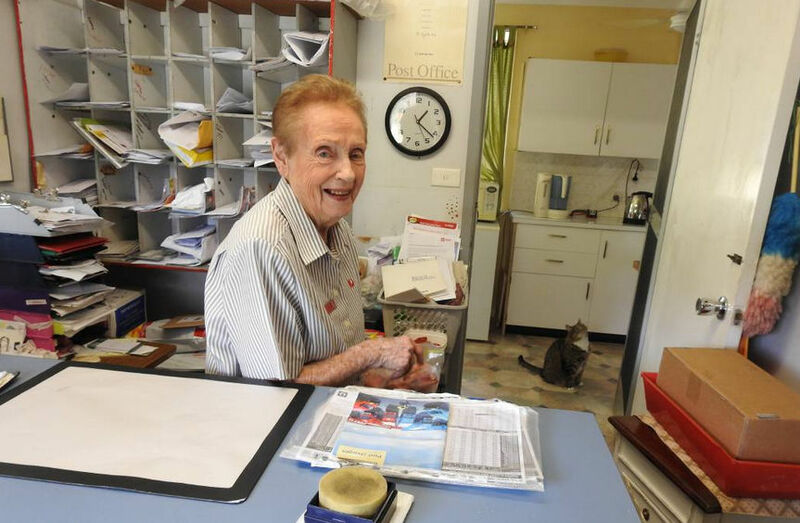 Kath has worked in the post office for 70 years, and has decided it’s time to retire. “I have always liked the job and loved the contact with the people. But I won’t miss the early mornings,” says Kath, who gets up before 5am and runs the post office from 8am to 5pm, Monday to Friday. Thanks to Long Flat residents who took the time to meet with Councillors and Council executive staff last week as part of the ‘Engaging and Communicating with our Community’ program. The meeting at the Long Flat Community Centre saw a good turnout, with numerous questions of local interest being submitted, including the Small Town Sewerage Scheme and maintenance of local roads and community facilities. Council is committed to moving forward with the actions agreed at the meeting, and continues to welcome your feedback and questions. To view the minutes from the meeting which includes answers to questions raised, visit pmhc.nsw.gov.au/communitymeetings. Stay connected by liking our Facebook page facebook.com/pmhc2444. Did you know Council has a YouTube channel? There’s lots of interesting and informative videos which include tips on sorting your rubbish, short films from the My Place Film Festival, and even videos showing the progress on some community infrastructure projects. Subscribe at youtube.com/pmhcouncil. Sign up for e-updates, job alerts and lots more at Council’s website pmhc.nsw.gov.au. Hi, I am updating the family tree of Newman Hollis 1816-1911, who lived in your area and still many relations still there. Sara Swanson from Wauchope did a tree in 1976. Any help would be greatly appreciated. I live in North Queensland but plan to come to Wauchope in May for research. If you can help Liz out, please hit the contact page and I’ll forward the details to her. Thanks. June Rollan and Rhonda O’Brien are pictured getting ready for the sale earlier this week | photo credit: Fairfax Media via Wauchope Gazette. 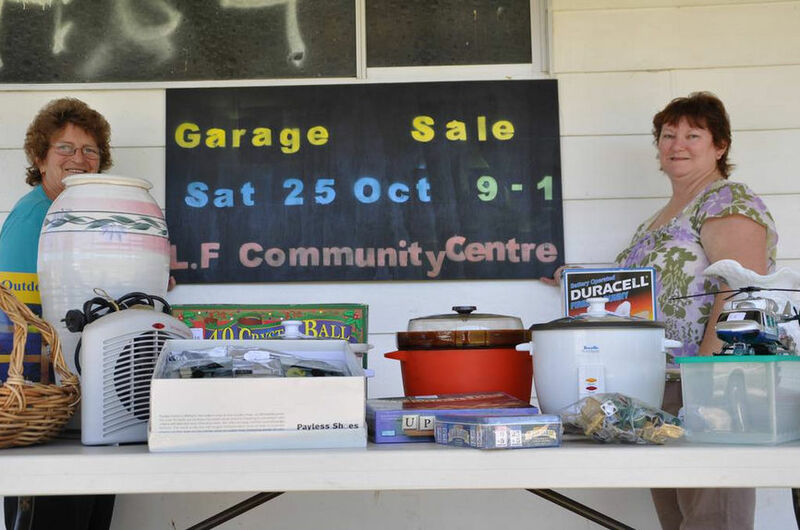 LONG Flat community groups will be out in force for the Garage Sale Trail on Saturday, with the addition of two stalls put together by the Wauchope Hospital Volunteers group. Eight other stalls are booked in for the sale, with funds raised to go to the Long Flat Community Centre’s activities. The Wauchope Hospital is a district health facility, volunteers group president Roger Adams said, so it likes to include the Upper Hastings villages in its activities. The second annual black tie Ellenborough Spring Ball was held on Saturday, October 18 at the Ellenborough hall. The idea for the ball was conceived by Long Flat P&C members Leanne Coombes and Vanessa Crowley with the view to hosting an old-time event ‘like we had back in the day’, complete with dances such as Pride of Erin, Gypsy Tap and barn dances as well as some modern music to accommodate all ages. The event has proved to be very popular with all funds raised from ticket sales going back to the Long Flat Public School P&C. The crowd was entertained this year by local band “Gotcha Covered”. 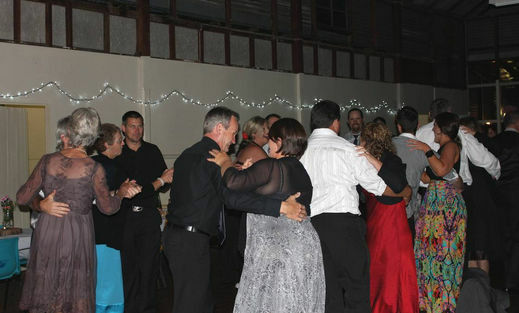 The event drew a crowd of locals as well as visitors from Wauchope, Wingham, Comboyne, Byabarra and Beechwood who came to dance the night away. The best dressed male was awarded to Dean Broderick with the best dressed female award going to Larissa Hardcastle. It was all Long Flat’s way in the first half at Long Flat on Saturday when Beechwood took to the field in opposition in the Hastings League rugby league competition. Josh Henry opened the scoring in the fourth minute with a try, which Corey Milgate converted, as he did the Keith Hollis try seven minutes later. Beechwood held on until five minutes before half time, when Tom Willemsen crossed, giving the Dragons their 16 half-time points. The Long Flat Dragons made short work of the Port Macquarie Settlers in Sharks on the weekend winning 30-16. The win saw the Dragons improve their standing in the Hastings League competition but they face bitter rivals the Comboyne Tigers this weekend. The rivalry is one of the longest running in the competition with the Tigers gaining the upper hand most recently. But the Dragons will be full of confidence following their recent victory. At the half-time break though the game was still in the balance with Dragons taking a slender 12-10 lead. JUNE Rollan is planning to have a cuppa at the Long Flat Hotel on May 19 and wouldn’t mind a hundred or more people joining her. 2011’s Port Macquarie-Hastings Citizen of the Year is organising another fundraiser for a worthy cause, just as she has done for the past 30 years. This year, June is hoping her Morning Tea at Long Flat will add to a community fundraising appeal for the Palliative Care Unit at Wauchope District Memorial Hospital. SOUTH West Rocks Marlins gave the Long Flat Dragons the rounds of the kitchen during Round 4 of the 2014 season played at Long Flat.